Before I begin talking about the Back to the Future Card Game, I think it’s worth mentioning that this is the first hobby card game I’ve ever owned. I’ve never played Magic the Gathering, and I’ve only had a brief experience with the Star Wars card game from Decipher. Card games aren’t really my thing, they’ve never attracted me enough to get into that aspect of gaming. It’s just not my thing. That, and the collectible aspect of most card games are also a huge turn off for me. 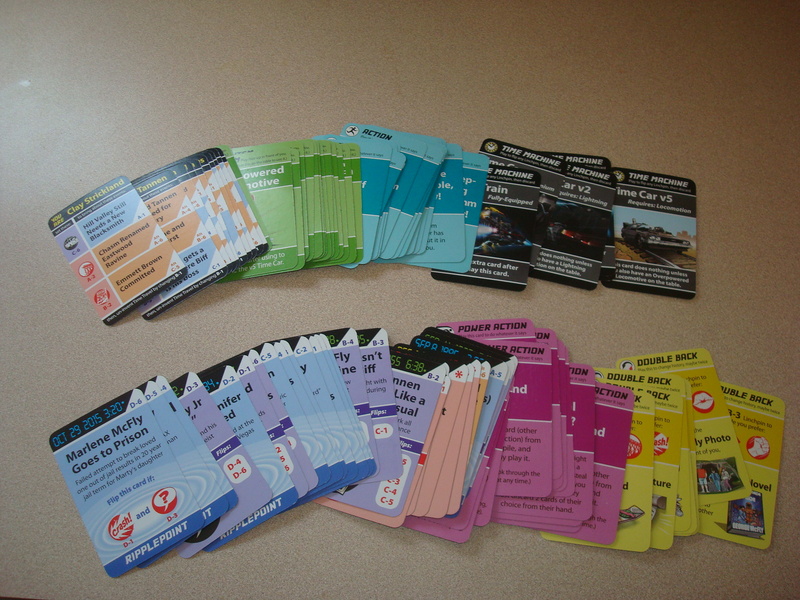 Having said that though, I really, really wanted to see what a card game based on “Back to the Future” would look like. I heard about it a few months ago and it really interested me, and once I heard that it was not a deck building game that forced you to keep buying and collecting cards, I was sold on the idea of playing it. So the good folks at Looney Labs were kind enough to send along a review copy. Back to the Future is a seminal movie of my youth. I was twelve years old when it was released, and it immediately grabbed me in much the same way the Star Wars films had a few years earlier. Along with Star Wars, Back to the Future was one of the reasons I majored in production, with the hopes of one day creating something along those lines. Yeah, I’m a big fan. A huge fan. So yes, I go into this game a little biased. So the game is played by arranging a set of cards called the timeline on the table. These are 24 double sided cards, 4 rows of 6, with one of the cards actually being part of a special stack made up of 5 cards. The players are handed an ID card, telling them who they are playing, and what their goal is in order to win. Each player has a goal, and that goal is to make sure that on the timeline, 3 specific things happen in order to ensure that character’s survival. The trick is that one player’s goals may not necessarily be beneficial to another player, so the game becomes a competition between players to constantly change the timeline around to their benefit. You change the timeline around by using other types of cards that allow you to flip the “linchpins” in the timeline and causing inverse things to happen by rippling the time stream, simulated by flipping other cards on the table. For example, a card may have Clara Clayton falling a the ravine, but your goal requires her to survive, so you make sure that that card gets flipped (where she survives instead), but that causes 3 other cards to get flipped, cards another player may need to stay facing the way they currently are. So that player would then need to fix the timeline he or she needs by flipping the cards back. There are also item cards, and special action cards that grant benefits like undoing a players last move and things of that nature. The special stack of 5 cards? That’s a special linchpin that actually causes Doc Brown to not slip and fall. Once your timeline is secured, you need to be able to flip that linchpin and hope that the Doc Brown card comes up. There are 5 cards there, but only one actually keeps time travel from being invented. The others are “mysterious forces” that keep you from being able to change destiny, and end the game. While what I’m describing may seem a bit confusing, it really is a game that clicks once you sit and start playing it. I’ve been able to play the game twice, once with fans of the film, and another time with casual “don’t care that much for it” folks. If you are a fan of the movies, the game is really fun, because the cards are nicely rendered and you can tell that the designers took their time to really get the little details of the movies in the game. 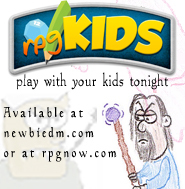 We were constantly throwing out lines and references as we were playing the game, and it added to the enjoyment. Overall I found the game to be a fun time, more so if played with fans that get the references in the cards and buy into the setting. The game can be highly competitive with the constant back and forth flipping and rippling of the various linchpoints in the timeline, and it does take about an hour or so to play through, but it’s a neat game that fans of the films, or the time travel genre in general should consider picking up. 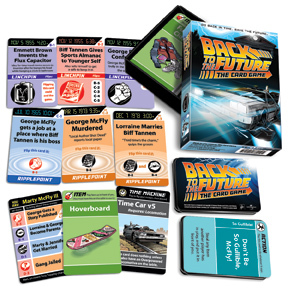 The Back to the Future Card Game retails for $20, and is available at your local game store or at Looney Labs. Is this basically http://en.wikipedia.org/wiki/Chrononauts reissued and branded for the movie? Ah, some searches show a few differences. Chrononauts was always a good time. It’s a fun game. It’s a modification/simplifaction of Chrononauts (which itself contains some BttF references), but it has enough differences to make it an enjoyable homage to those movies. I picked this up at PAX and have played it several times with family and friends. While it looks daunting at first by the second go-around everyone will be screwing each other over. For a party game, this is one of the best. write. The sector hopes for even more passionate writers like you who aren’t afraid to say how they believe. At all times follow your heart.